I received an email a few weeks back from a Michigan Technologic University student, Phillip Schichtel. 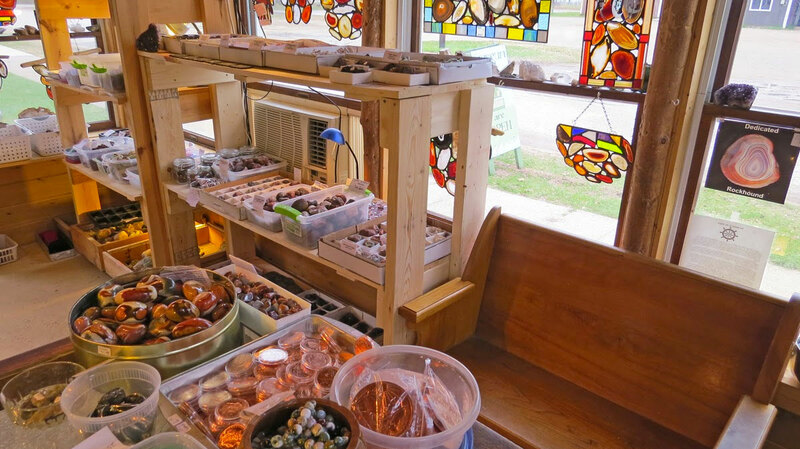 He is an avid agate hunter who looks on the beaches in the Keweenaw, as well as by his family’s cabin near Muskellunge Lake, located 20 miles east of Grand Marais. I must admit that he has found some dandy agates! Make sure the glass in the jar is strong enough to adequately support the weight of the rocks. If possible, use glass jars that are made of tempered glass. To prevent the growth of algae, add a little bleach to the water. For smaller jars, just add a few drops. For larger jars, add up to a capful. If the jar you are using is fairly wide, rather than take up space in the middle with agates, either use other rocks to fill the middle space, or insert a skinny glass or other jar in the middle, and fill the outer space with your agates. Change the water in your jar a couple of times per year. Note that if you display your agate jars on a sunny window sill, the sun can influence agate banding. I have had some people tell me that sunlight improves banding in some agates in a manner similar to heat treating. Others have told me that prolonged exposure to sunlight negatively affected the banding in their agates. In most cases, though, sunlight should not impact agate banding, especially if your agates were found on the beach and have already had prolonged exposure. The greatest risk of keeping your jars on a window ledge is that other people walking by your house will be able to see them. This is especially a problem if you are not in the habit of locking your doors. .I have heard of more than one case wherein someone returned to their unlocked home to find their agate jar missing. DO NOT fill the jar with baby oil, or other type of oil. A friend of mine did this several years ago and the baby oil penetrated into the agate bands and decreased the quality of the banding.